Only 7.5 ounces with 11 bearings—we call that a major overhaul! The Quantum Tour Edition PT Baitcast Reel features scratch-resistant titanium vacuum deposition coating, 11 PT bearings, ACS II external adjustable centrifugal braking; dual PT bearing Continuous Anti-Reverse; CNC machined-aluminum frame, and lightweight carbon fiber crank handle. "The handle is loose and moves back and forth without moving the spool. This reel is supposed to be a more refined version of the previous Tour, but now comes with less brake adjustments (three compared to ten)." "I have been a big fan of Quantom for a number of years but after a while I found the reels to be abit bulky. 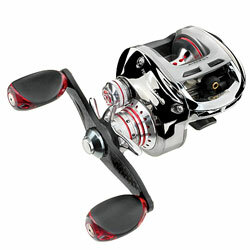 But now that Quantom came out with this new line of reels I have no regrets about buying it." "This is my second Quantum Tour Edition, Like the previous reviewer, I own one of the last year's models (Model 1160 that you always see KVD and Bill Dance using). This reel is superior in my opinion." "Quantum took their best reel, made it look real pretty, and removed the best feature...the 'Infinite Cast Control' I couldn't believe it when I found they replaced it with the same 3-setting adjustment system they use in their $60.00 'Accurist'!"